In the last post, I told the way to implement Disqus Combination widget to your web site which have recent comments, popular threads and commented users, all in one. But, if you only need one of it, why load all 3 of them. 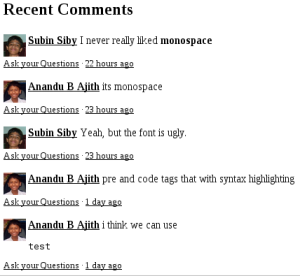 So, if you only want the Recent Comments widget, you will find this post useful. You can also see a demo on JsFiddle. 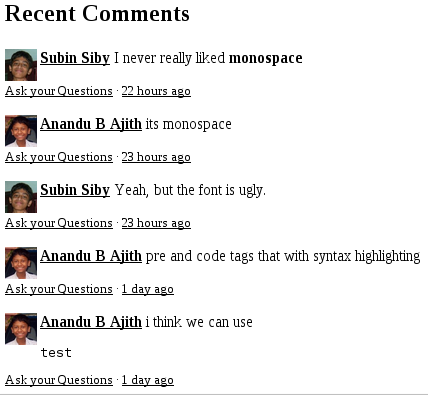 You should replace the "example.disqus.com" with your Disqus forum URL ( "shortname.disqus.com" ). As I said in my previous post, this widget also supports configuration like the "Combination Widget". avatar_size 32 The Size of the avatar of user. You can add this code in Blogger, WordPress and any other Blogging services. Then, paste the code and click "Save" button.